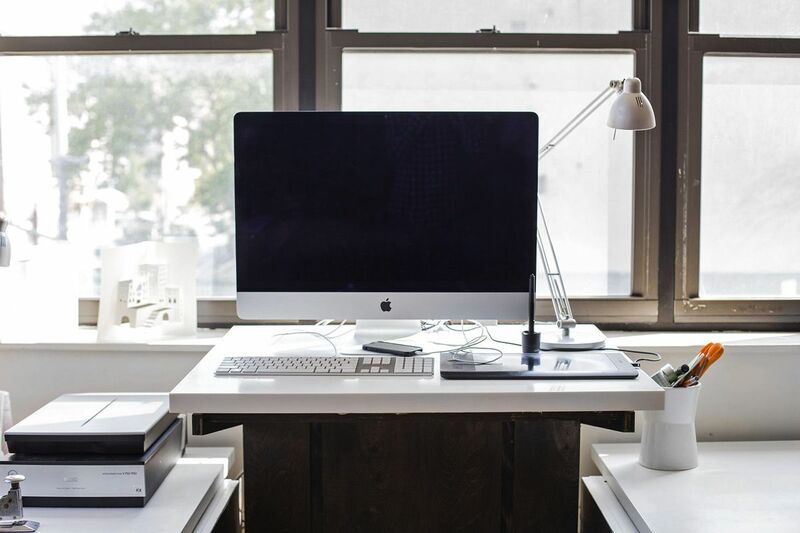 I rely on my home office to keep everything straight, from school lunches to blog posts, which is why I’d love to have a creative workspace that looks so great that I really want to be there, rather than at my local coffee shop. Let’s be honest, as a working parent, my mind can to be pretty cluttered; I’m thinking about deadlines while I’m cooking dinner, and I’m organizing playdates while I’m checking email. 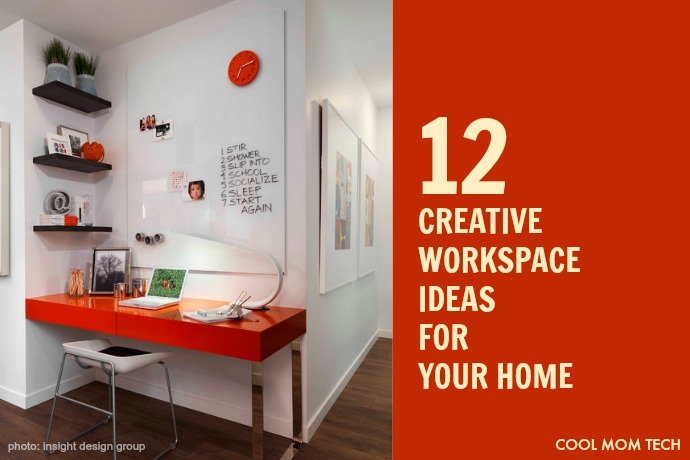 These 12 innovative, beautiful and creative workspace ideas—for parents and kids too—are inspiring me to want to stay on task. We’re hearing more and more about the benefits of standing up at your desk, so I’m intrigued by Kelli Anderson’s creative workspace idea. This standing desk IKEA hack was created so that the section for her computer can be raised to a standing desk when she gets tired of sitting. Pretty cool, if not entirely an easy DIY. See her site for all the instructions. My award for most clever may go to this rolling bench seat that slides right into the built-in shelving. 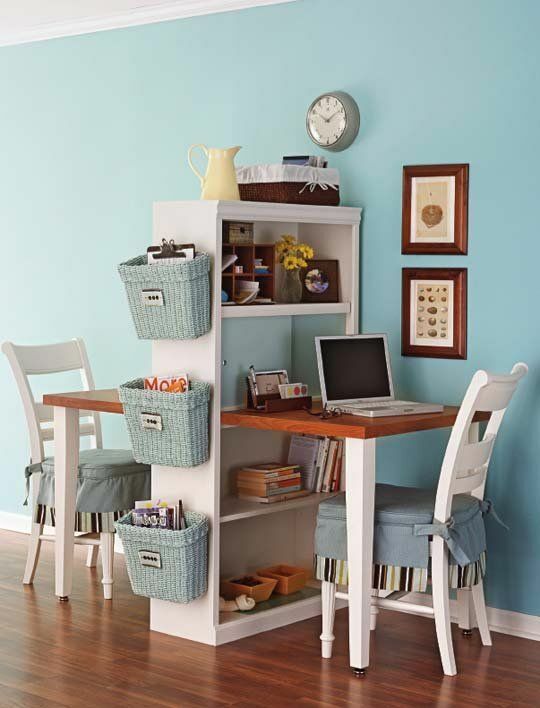 This is so perfect for families who don’t need a major workspace and want to be able to “put it away” when company comes. Those cubbyholes all the way up the shelving can be filled with pencils and other school supplies so your kids always know where they are, and I’d be sure to use that space under the seat for storage too. The minimalist Danish look is perfect in Ferm Living founder Trine Andersen’s office featured at Design*Sponge. 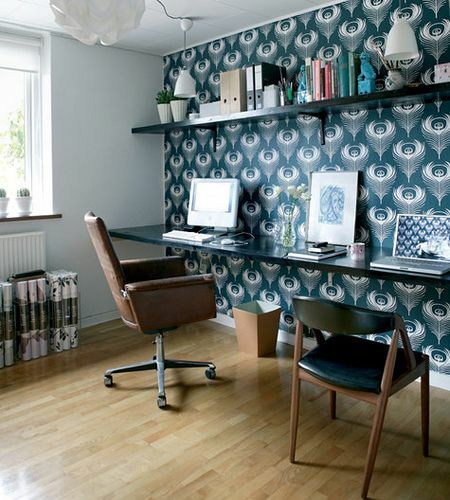 Her storage is, er, stored away somewhere (I’m hoping there’s a huge filing cabinet out of view) but wherever it is, it’s really the striking wallpaper that divides the office area along the wall from the rest of the room. Huge props for going with such a bold, fearless pattern! 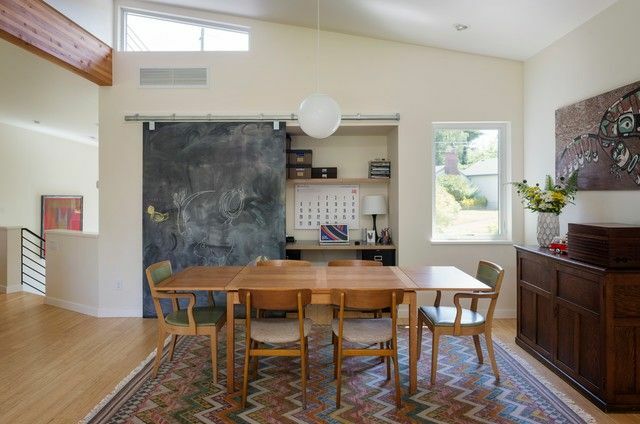 On the off chance you don’t always keep your desk so clean, or you simply don’t have the space for a full office, you can hide your workspace out of sight behind a rolling barn door, like this one made of chalkboard by Whitney Architecture on Houzz. I love this creative workspace idea which provides a decent amount of storage and a proper desk, only it’s easily closed away when company comes. Or when you want to keep that tempting screen out of the sight of kids when it’s mealtime. Another version of the built-in desk is done so beautifully here, in this funky, small workspace design by Sett Studio in Austin, Texas. Just in case the cowhide rug didn’t give that away. 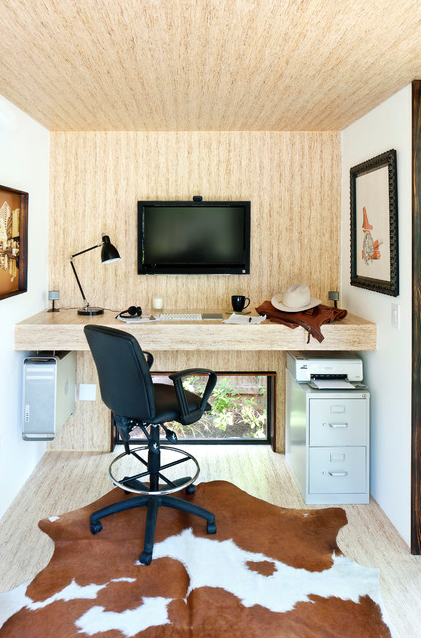 If you look closely, the office is actually in a tiny backyard shed facing the garden, which is another smart idea: If you don’t have enough space (or privacy) in your home for an office, convert a garage or shed. 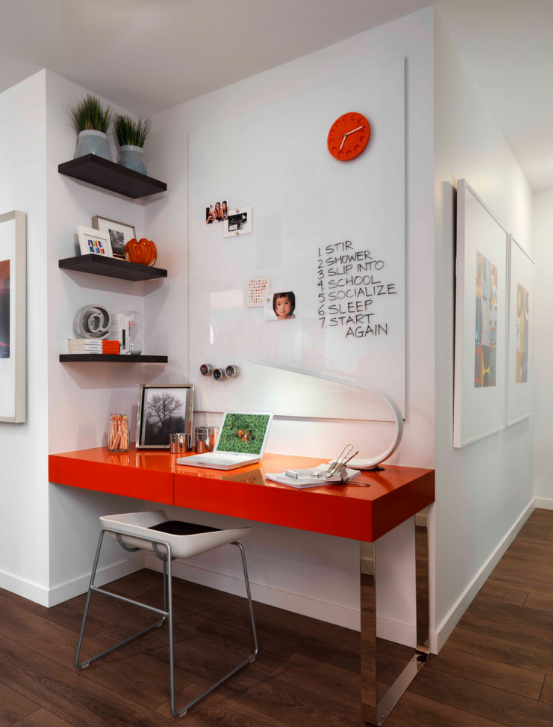 Our kids need workspaces of their own too, and this recessed desk built into an unused closet space is a brilliant workspace solution. I mean, the storage! The doors! The divider that promises to keep my kids from bickering! Okay, maybe that’s asking too much. But I love everything about this novel use of space by Kathy Corbet Interiors. Provided there’s somewhere else to keep their clothes, of course. Space-saving is a major design factor for many families, and I think this built-in sleeping space with a pull-out desk designed by Susanna Cots is such a cool idea. You can stash your laptop and other gear in all that amazing storage space, and then a plug (or a larger adapter) is right there when you need to charge your devices. To be sure, this is not an easy weekend DIY; hire a contractor and a serious designer like Susanna for this one. 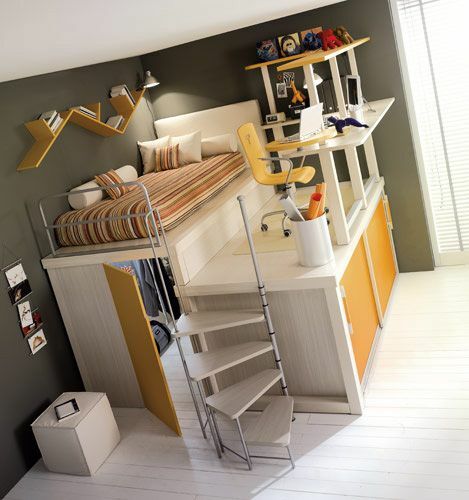 If “rolling chair” and “elevated desk” don’t immediately make you think “emergency room” when it comes to your kid, then check out this incredibly clever raised workspace on Kidsomnia that makes great use of small space. I would definitely make sure that desk is built in (though I’m sure it is) and reconsider the casters on the chair. But otherwise, that’s pretty awesome. Another way to put multiple kids–or even just two adults– in a small workspace while still keeping them separate is this crafty DIY bookshelf hack desk we found at Apartment Therapy (which is always filled with fabulous ideas but you probably know that already). I’d probably style it a little differently—more modern accessories and no skirted chair covers for me—but the idea is really a great one. This tradition solution is still great way to make the best of your space, only it doesn’t have to look so traditional. 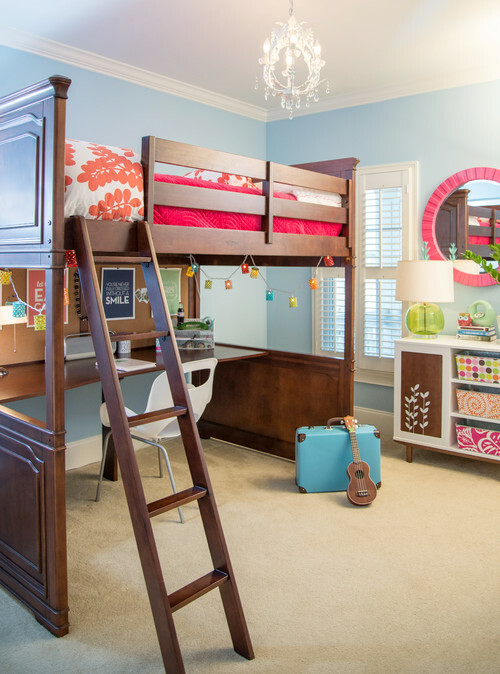 This cool loft bed design by Rosenberry Rooms on Houzz is a sleeker piece of furniture than some we’ve seen, and the workspace and storage space you get underneath are impressive. I might cut that desk in half and include a mirror to create a vanity, and free up some precious bathroom time in the morning too. As your kids get older you’ll know just what I’m talking about.